A boy called George had a wonderful plan To search for a real pirate crew. So he packed up a pizza, his favourite feast And rowed across the wide ocean blue. George, a young explorer, longs to meet a real pirate crew. So he sets sail with a cheesy treat to sustain him on his voyage. Join George on his travels as he finds scurrilous sea dogs and marine monsters - not to mention a feathered friend! 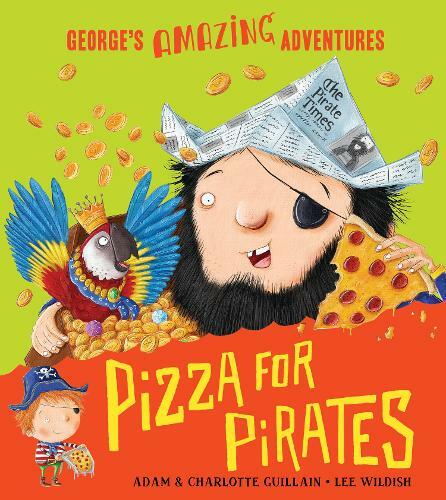 Pizza for Pirates is a funny rhyming romp, the perfect read-aloud adventure book for boys and girls aged 3 and up! Ideal for fans of Pirates Love Underpants and The Pirates Next Door. George's first adventure Spaghetti with the Yeti was shortlisted for the Roald Dahl Funny Prize and Highly Commended at the Sheffield Children's Book Award. Have you collected all of George's Amazing Adventures: Spaghetti with the Yeti, Marshmallows for Martians, Doughnuts for a Dragon, Pizza for Pirates, Socks for Santa Treats for T. rex Adam Guillain is a children's writer, musician and a co-founder of Storytelling Schools. Charlotte Guillain taught English to air traffic controllers and nurses before deciding a career in publishing would endanger fewer lives. They have written several picture books together including Supermarket Gremlins, School for Dads and the George's Amazing Adventures series. Lee Wildish lives in Lancashire and has been illustrating from a very young age. His titles include The Spooky Spooky House which was the winner of the Red House Children's Book Award 2013, and the New York Times bestselling How to Babysit a Grandpa.